Art time yesterday was spent stitching on the appliquÃ© wall hanging I’m doing for City and Guilds. I think I’ve posted enough ‘in progress’ pics of that – the hand stitching is taking a long time, but I want it to be finished next time you see it! 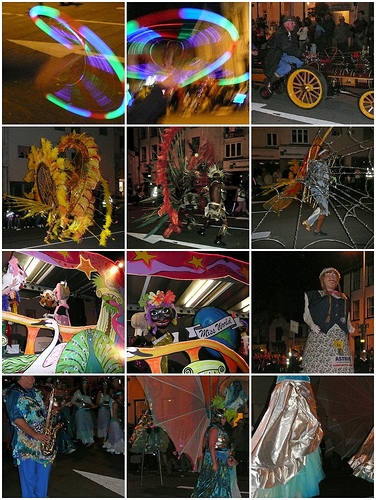 In the evening we went down to the Kendal Torchlight Carnival, a procession of marching bands, Caribbean carnival bands, heavy horses, steam engines and decorated floats. I haven’t quite mastered the art of night-time photography but a few pics did come out OK. I love seeing the dramatic carnival costumes and the dancing and drumming is so exciting. The mosaic links to my Flickr. The last week has been mad, work-wise, so not much happening, art-wise. I worked in my sketchbook a little, and got round to watching a very interesting ITV1 programme – Harry Potter: The Costume Drama. Ben Shephard was talking to a range of people in the wardrobe department about the way they created the costumes for Harry Potter and the Order of the Phoenix. They even have a ‘breakdown department’ where people spend their whole working day distressing the garments after they’ve been made or bought. Why did no-one ever tell you about that kind of job at school? I was particularly struck by the head of the wardrobe department, Jany Temime, and her approach – how the costumes themselves contribute to the acting – fascinating. She also said – never let your ideas be constrained by what’s practical – you can always find a way to do it. Though I’m not quite sure this can be extended to everyday wearable art (the really wearable kind, I mean) since she also said later on that many of the costumes can’t be washed (they make several of each instead)! Part of my work week was setting up a gallery for all the entries to a competition run annually by the UK Embroiderers’ Guild for its members. The 2007 theme was Water, and the brief was to create an original design, primarily hand stitched, though the work could include any technique. Working with all those lovely watery images was very soothing… If you’d like to immerse yourself – the gallery’s on the Embroiderers’ Guild web site.